Two clusters of storms are bypassing the region, with a trough and frontal boundary moving towards the area from the northwest as the day goes on. We'll be watching east AR for thunderstorm development late this morning that would affect the metro. Computer models are in two camps this morning. High-res models generally think that we'll see a round of storms early this afternoon out ahead of the front, with another potential round this evening as the front actually moves through around 9-10pm. The legacy models lean more towards a round of storms later in the afternoon with very little along the front that arrives later, closer to midnight. 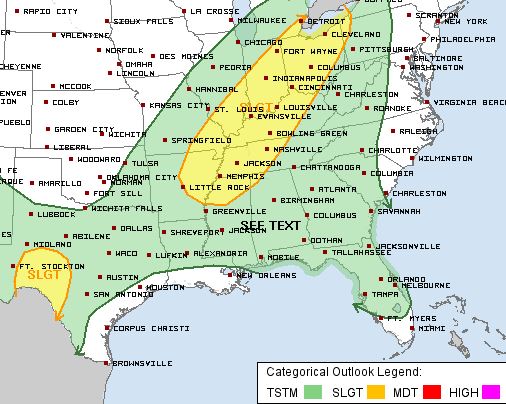 As for our chances of severe weather, a Slight Risk is posted for the entire metro. 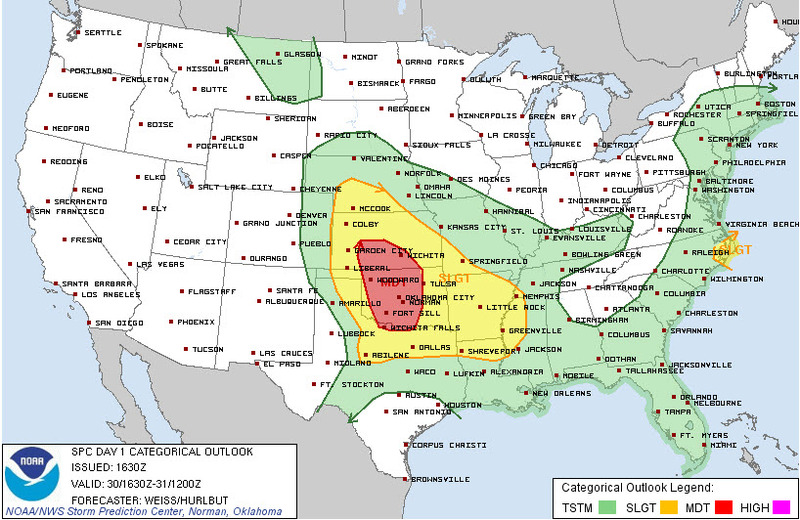 The graphics below highlight the risk area as well as the probabilities of various severe weather types. 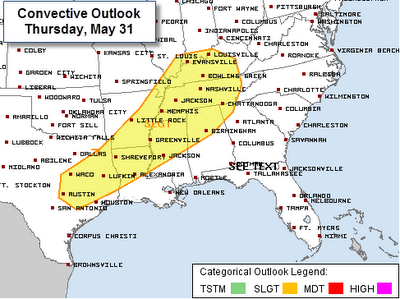 Our primary threat will be damaging straight-line wind (a 30% chance of 58+ mph wind within 25 miles of your location over west TN and north MS), with a secondary threat of severe (1") hail. Given the lack of a favorable low level wind profile and barely-sufficient low level moisture, the tornado threat is hardly worth mentioning. Mid-Southerners should be prepared for the possibility of strong to severe thunderstorms from lunchtime through the evening. Behind the front, MUCH cooler weather is expected Friday with highs only in the mid 70s. Lows Saturday morning will be in the 50s with highs again below normal (in the lower 80s) on Saturday. MWN will provide nowcasting throughout the day on our social channels listed below. It's also a good time to pick up our mobile app for Android or iPhone with StormWatch+, which will alert you if your location is in the path of a severe thunderstorm. Stay weather aware and have your umbrellas handy today! 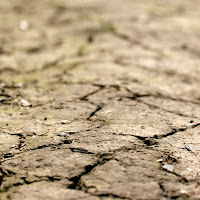 We could certainly use some rain! It appears computer models are holding off on any early morning precipitation for the Mid-South. Given the information provided in the blog post immediately below, our confidence is increasing we will see some severe thunderstorms in and around the area beginning anytime after late morning. 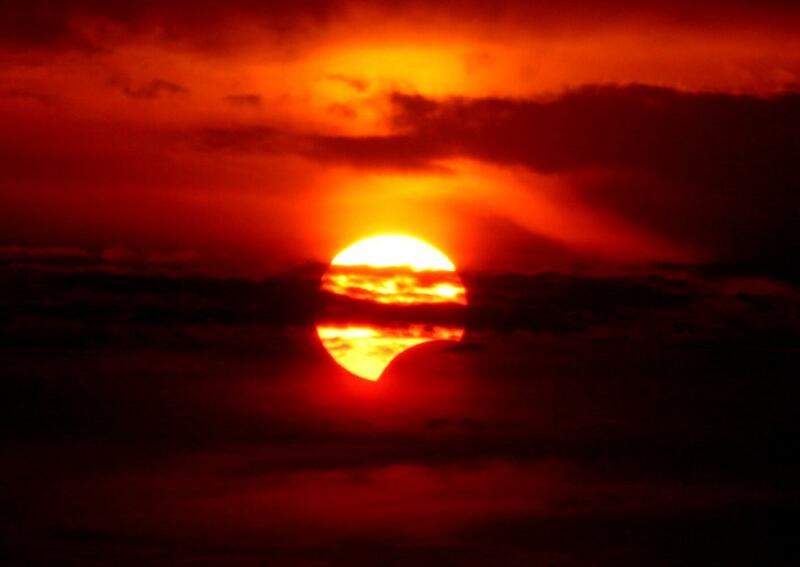 The most likely time will be during the afternoon and early evening hours. Though a tornado threat can't be completely ruled out, the primary threats with tomorrow's storms will be large hail and high wind. Storms should form into clusters or lines, which could heighten the straight-line wind threat. MWN will provide nowcasting via social media throughout the event tomorrow. Now is a good time to arm yourself for the potential of severe weather with the MemphisWeather.net app with StormWatch+. StormWatch+ is our personalized severe weather notification tool that will warn the locations you input when severe weather threatens. Check it out now on iTunes/App Store or Google Play for Android. 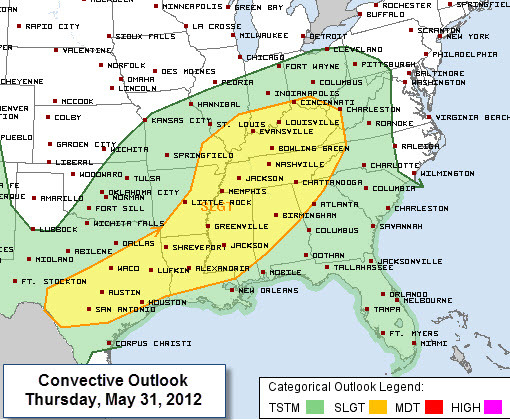 The Mid-South is under a Slight Risk of severe weather for Thursday. 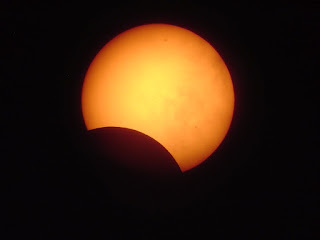 How the scenario plays out is the subject of this blog. Another day has brought little clarification in exactly how tomorrow's weather scenario will unfold as the biggest factor in possible severe weather appears to be how overnight convection (storms) plays out to our west. What appears certain is that at least part of Arkansas will experience one or more mesoscale convective systems (MCS's) overnight that will move generally east and weaken as they approach the metro around dawn. These types of systems can have several effects on the weather downstream, both positive and negative, depending on their ultimate evolution. Some of this was hashed out in last evening's blog on the topic. 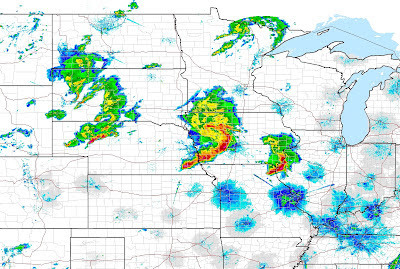 Upstream MCS activity can bring extensive cloud cover or rain to an area as they fall apart during the early morning hours, thus providing a stabilizing influence and limiting renewed thunderstorms later in the day. The atmospheric disturbances (mesoscale convective vortices - MCV's) that linger following the demise of these systems also can bring a source of lift to a region that can reinvigorate storms when combined with sufficient heating and instability. Generally areas under the "fallout" of one of these MCS's as it weakens ends up with a greatly reduced chance of storms later in the day, while areas downstream of the "fallout zone" get the benefit of daytime heating (providing instability) and lift from the disturbance left behind by the decaying storm system upstream. Satellite imagery at time of above radar image. Extensive cloud cover accompanies MCSs. 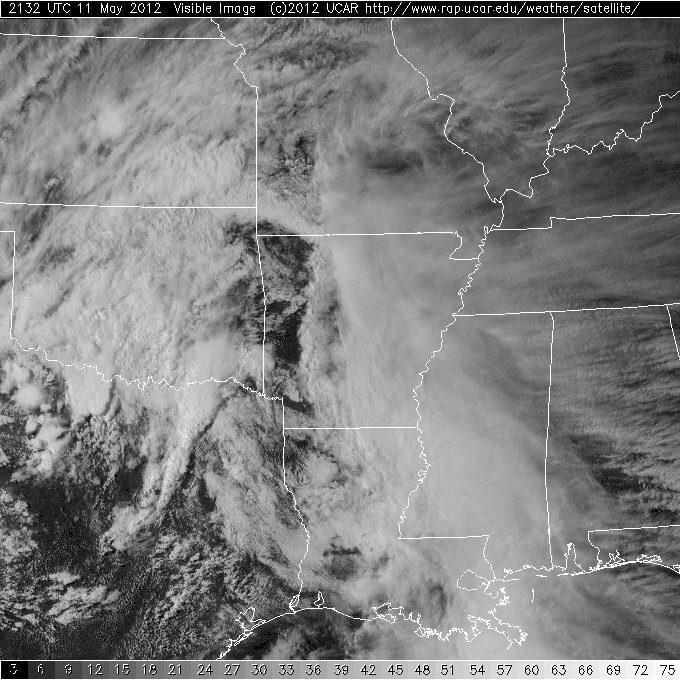 After the MCS falls apart, the lingering cloud cover can hinder further convection later in the day. We've seen both cases play out in the area, as well as the unmentioned case where the overnight convective system never weakens and comes through in a strong to severe state in the early morning hours. Right now, I don't really see that happening. So, will the overnight storms die off over AR, leaving us with an unaffected "juicy" airmass capable of generating afternoon/evening severe thunderstorms? Or do we get the "fallout zone" - with morning clouds/showers and afternoon storms that fire off to our east? Time will tell... Either way, I think this will be our best chance for meaningful rain in some time. 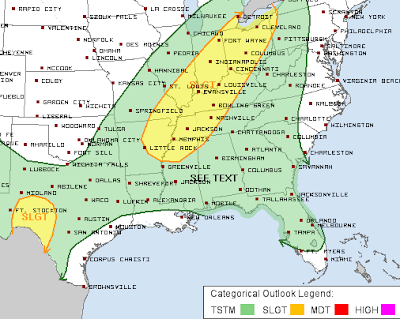 At 11:30am, the Storm Prediction Center added parts of the Memphis metro to their Slight Risk zone for the possibility of severe weather, mainly for damaging wind and hail chances this afternoon. 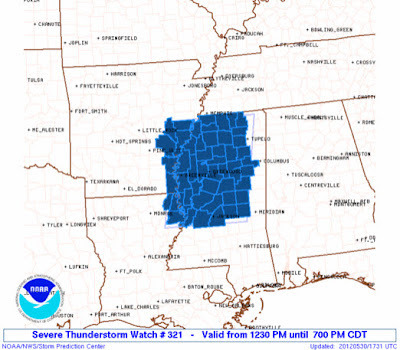 An hour later, a Severe Thunderstorm Watch was issued for north and central Mississippi and southeast Arkansas. 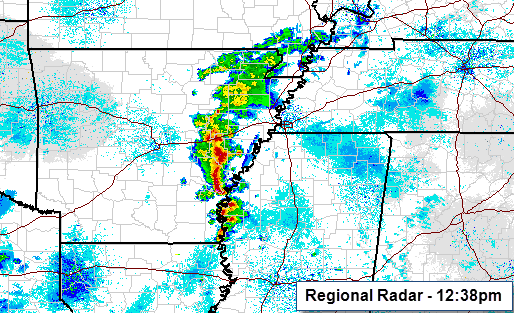 Regional radar shows an area of thunderstorms, a few of which are severe warned in southeast AR, moving east into the watch box. Some of these thunderstorms could affect the immediate metro area by mid-afternoon, though the strongest storms will affect north MS, potentially including the metro counties. 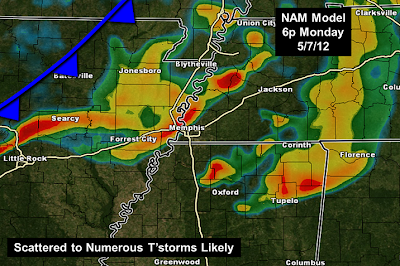 Stay with MemphisWeather.net via social media for the latest developments as we nowcast throughout the afternoon. In addition, be sure to download the MWN mobile apps for Android and iPhone and then upgrade within the app to add StormWatch+ for personalized push notification weather alerts for your specific location. 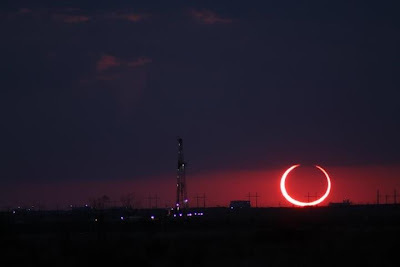 All links can be found below. Memorial Day weekend was just as advertised, and as we have come to expect in the Mid-South - dominated by heat! With temperatures in the lower to mid 90s for the holiday weekend, the only minor relief was that the humidity was not off the charts, so heat index readings didn't quite reach 100. The heat continued today as we got within 1 degree of the record high for the date, topping out at 95. The strong persistent high pressure responsible for the heat and lack of storms is weakening and moving east though, as a trough of low pressure replaces it. 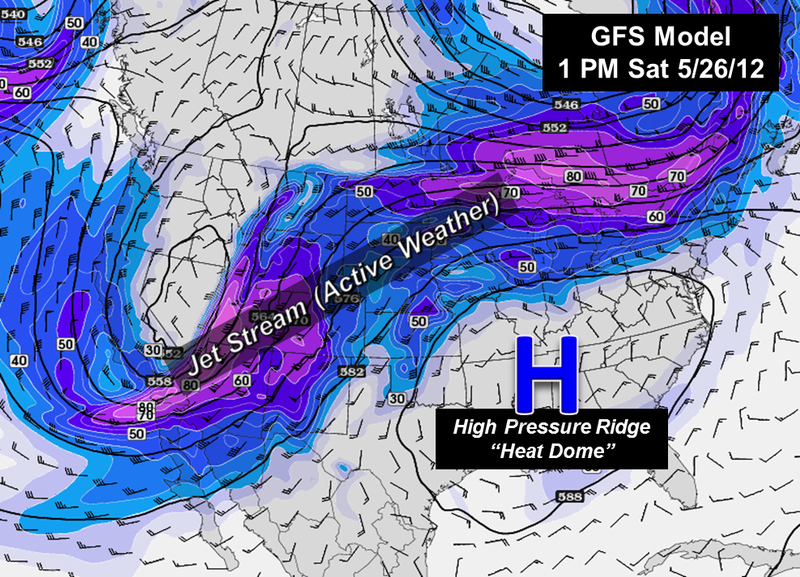 The trough will push a strong cold front through the region on Thursday. 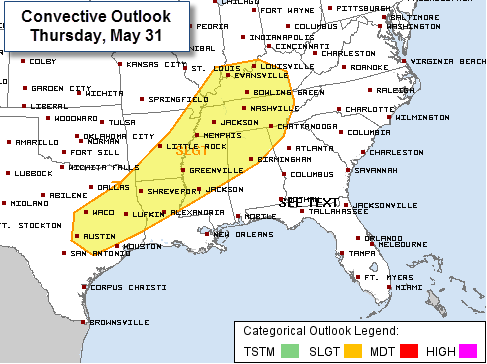 Ahead of the front, the Storm Prediction Center has initially placed the entire region under a Slight Risk for severe weather on Thursday (see graphic below). For Wednesday, a few more storms may pop up than we have seen the past day or two as a weak cold front straddles the region. Dry conditions will persist one more day for most areas, even though increased cloud cover should hold high temperatures down into the lower 90s. 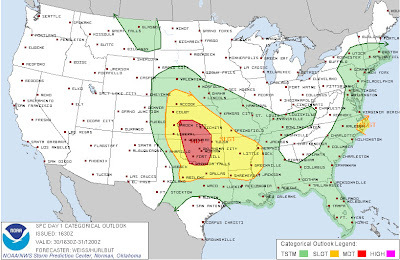 On Wednesday night, strong to severe thunderstorms across the central and southern Plains will move east-southeast towards the Ozarks and eventually the Mid-South. 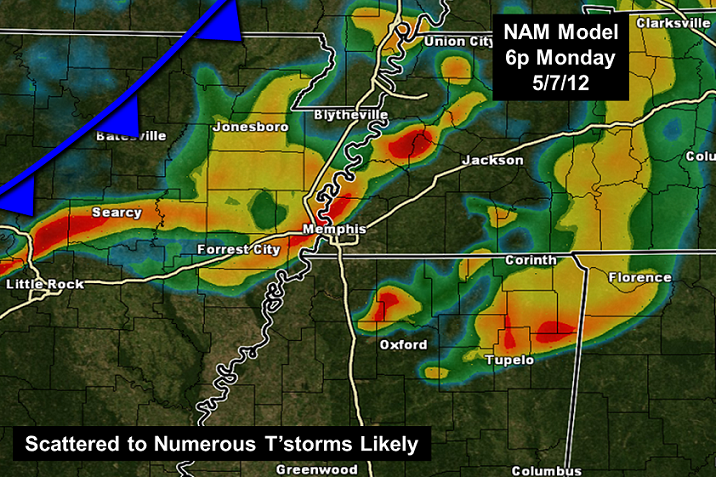 These storms will be the fly in the ointment for Thursday as far as our severe weather chances are concerned. Though the storms could be severe as they move across Arkansas Wednesday night, it is not unusual at all in this pattern for storms to be in a weakening state as they arrive in the metro, especially if it is near dawn, when the atmosphere is generally least conducive for severe weather. So, while they may bring some heavy rain and a few claps of thunder, many times this scenario produces showers and extensive cloud cover. The cloud cover then sticks around a good part of the day, outflow boundaries from the morning storms move by to the east of the area and, when afternoon and evening storms form along the cold front, they do so east of the immediate area and rob the region of not only a threat of severe weather, but some much-needed rainfall (the region stands more than a foot below normal rainfall amounts by this time of year). 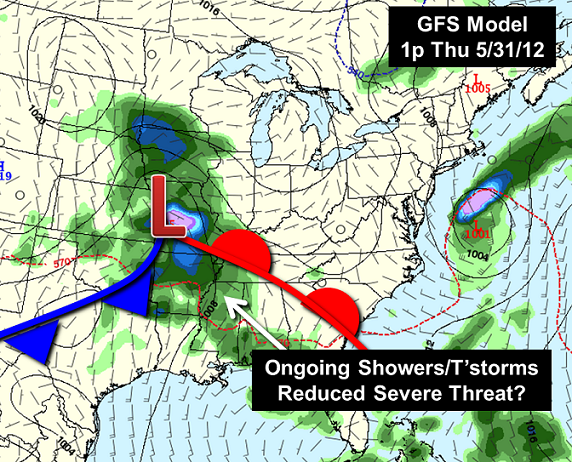 Above is a graphic showing the GFS model's interpretation of the weather scenario at mid-day on Thursday. The positioning of the frontal systems and low pressure are good for possible severe weather, but if the precipitation the GFS shows well out ahead of the cold front materializes, our slight risk may be overstated. We'll see how later model runs handle the scenario. The best scenario for severe weather would be to have limited cloud cover in the morning with no rain and a primed atmosphere when the front comes through late in the day. Behind the front, much cooler air will settle in for a couple of days. Friday's high will be only in the 70s with widespread 50s on Saturday morning. The cool-down will be brief, however, as strong summertime high pressure re-builds late in the weekend, bringing the mercury back up to the 90s by the start of next week! However the severe weather scenario works out, you can count on MWN to be monitoring the situation and bringing you the latest via social media and the MWN Forecast. 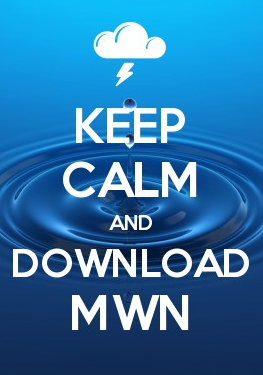 If you haven't yet downloaded the MWN app for iPhone or Android devices, now is a good time to do so. Be sure to activate StormWatch+ in the app so that you can be alerted when and if severe weather threatens your location!